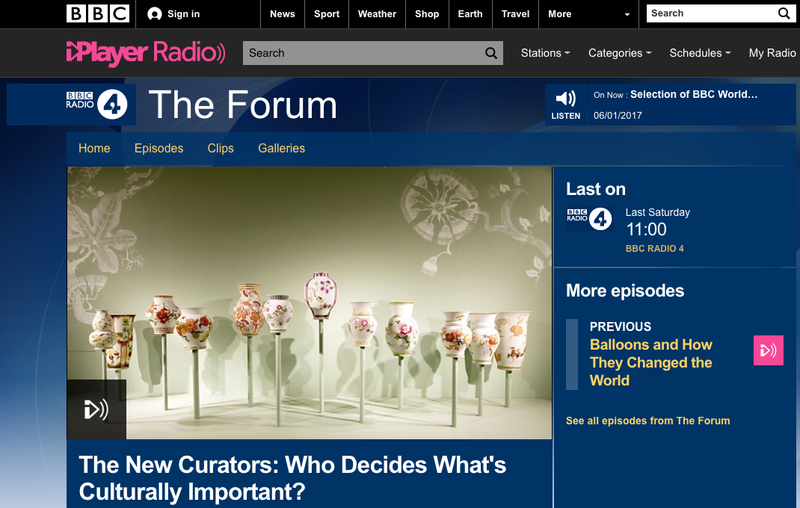 Another day, another public conversation on curating…this time between a pretty diverse and international mix of minds and perspectives. I’d be interested to know how and why they were brought together. I’m missing my engagement with the BBC here in Melbourne, so I’m glad I can access this online. My question is what happens with “digital” information like this? Does it contribute to a wider curatorial discourse and on-going history of the curator? Or does it get lost in the ether, in the overabundance to which the speakers allude? I’m definitely going to get my Masters in Art Curatorship students at the University of Melbourne to listen to this early on in Semester 1…anticipating interesting discussions afterwards, where it would be great to share them with ‘The Forum’ speakers. Not mentioned within their discussions was the need for curators to be digitally and culturally adaptive to the international art landscape they inhabit (weight on cultural adaptation and assimiliation here), the influence of (curated) social media, Internet art/art online (including art market platforms) and the changing realm of arts journalism (given it was only a 28 minute discussion). There is also something to be said about the role of the curator as mediator and change-maker in today’s unpredictable socio-political climate, which I’ve witnessed first-hand in many Asian cities. Also, in what I perceive as the disposable age we live in, curators must be “passport ready”. I know this far too well (I’m not complaining!). Readers, let me know what you think, as this discussion is never-ending. In the age of superabundance, what today is the role of the curator? Not just the art expert, the newsagent, the travel agent, the bookshop assistant. Do we need “guides” to tell us what’s good anymore? Bridget Kendall began by asking people, how would you define curation and being a curator? Tasneem Mehta: Unpacking ideas […] new possibilities, unpacking histories, it’s about developing critical meaning in partnership and discussion with artists and publics […] my work at the museum works on two levels. One, it’s about the historic environment and how one communicates that, and the other is about contemporary art and what’s new and exciting and how to put that forward to the public. Hans Ulrich Obrist: Historically the curator’s role began to coalesce around 4 functions, still relevant even though new ones are being added. 1) preservation and safeguarding; 2) selection of new work, caretaker of the museum becomes the caretaker of legacy; 3) contributing to art history and scholarly research; 4) displaying and arranging of art on the wall, the making of exhibition. This is the task that has become most to define the curator. A neologism is needed. Michael Bhaskar: This is a word that has really changed. For many years it was about museums and art then something curious happened, it began to be applied in a range of strange contexts…curating a wine list, curating a fashion store. What I think they mean is selecting and arranging. What I think curation has come to mean in these new contexts is selecting and arranging to add value. BK: Curation is a buzzword in today’s digital day and age. MB: In the 1990s, in Silicon Valley, you had the explosion of the internet and that’s where the word jumped off at a tangent. We’ve ended up in a situation in society where we just have vastly too much of many things and we tend to think the problems of the world are problems of scarcity, when in some regions it’s of abundance […] we have an economy for roughly two centuries that has been built around growing choice and producing more […] simply producing more wasn’t working […] in some many areas people where looking for something which capture how people were selective, and curator worked. BK: Has curation displaced creation? MB: I think there is this lionisation of creativity in our society […] everyone is creating all of the time […] the Internet is this great democratic engage to unless creativity to the world […] creativity backfires, what we need is to find what is significant, simply adding more is counterproductive. HUO: The idea of the curator is a junction maker, it means bringing artworks, making junctions between artworks […] post-1960s brought an expanded notion of art, basically calls for a different type of curating […] expanded notion of art leads to an expanded notion of curating. BK: There is a tension between creation and curation. TM: Michaels expanded notion of abundance and excess is very elitist. In India, the idea of curating excess […] I can understand how it is used as an important tool for businesses and marketing products to make them more interesting and valuable for consumers, but I must say find it reductive. For me, curation is about thinking deeply, about the junctions as Hans was saying, about the ideas and how then do you expand that […] to bring out hidden histories and stories that weren’t there […] I understand that it has been hijacked and become a grab all kind of word to be used. I still find that to compare the kind of curation a museum or gallery does in the art world with someone who curates a food list is reductive. MB: I wouldn’t disagree. Many uses of the term are elitist. There is a lot of explicit curation that takes places in trendy places […] that is very elitist […] it’s significant in that it’s happening in lots of places that set wider trends and of course, we don’t live in some total utopia where there’s abundance everywhere, there enormous amounts of hardship everywhere […] they co-exist]. Beyond this explicit curation is an implicit curation that’s going on, that’s when we have people or activities that don’t even identify themselves as curation but are selecting and arranging […] there is this powerful curation where you need to be an expert and you need to study it. BK: Is there a danger the wider use of the word is somehow undermining its use in the traditional sense? HUO: If you look what it means in terms of a generation of emerging practitioners now […] there was this idea of research not consumption […] didn’t want to proclaim where curating was going but learn from practitioners because ‘change comes not come from men and women changing their minds, but comes from change from one generation tot he next’ […] in the last 3-4 years, we see certain patterns emerge. One pattern is interesting in relation to this question of overabundance. In terms of this generation, the limits of growth, a limit of resources, which is suddenly a big topic in these artists work and even more so in relation to information […] how important the ‘filter bubble’ becomes. Initially the world wide web was an enquiry zone, a place for research, an open garden, to be a flaneur of information, where more and more it produces a “lock-in” syndrome […] we are only going to be confronted with ideas we already believe in rather than things we disagree with. BK: What you’re saying also relates to geography, as curation as conjuncture. HUO: I think this ties in also with the idea of globalisation and the writer Edouard Glissant, a relevant writer of our time. He always said the danger of bringing things together in terms of curating is that it creates a kind of continental logic, a continental logic is homogenising and rejects mixings. We need not a continental logic, we need not exhibitions or curation as a continental way of proceeding, we need an archipelago, they lead to creolisation, they lead to mixings. TM: […] showcasing innovation […] curating is a social engagement, it is about bringing this interesting history, brining people to interrogate their history, their own past, their environment […] it is about how identity is created and challenging some of those ideas. The word curation in India, people are calling themselves more in relationship to art curators, because it is something fashionable, where the curator is now more important than the artist […] there is power in that, which to me is slightly distasteful. I have resisted it and tried to be invisible as a curator because of the power equation involved in it. MB: In so many contexts, politically, in the world of retail, in the world of information, in our culture at large, who curates what is just a massive question and trust and power is at the heart of it. I think this idea of the digital and the analogue is really interesting, because these new uses of the word curation were really pioneered on the Internet and in digital contexts but they have very much become an offline thing. Actually, what we are not seeing, as a lot of people always assume, is there this analogue universe and this digital universe and what we are seeing is a complex blend of them both. What the future is, is these blends. HUO: Power is always with art […] the idea of art being at the centre. The curator is a catalyst, is an enabler. The curator in a museum or society has a very important role to enable the artist. The curator as enabler.